The title of the game makes me wonder if Chick fil-a isn't one of the sponsors. even when i enjoyed dear esther, this sounds good as well. the caev level was still the most stunning level i have ever seen in a game. hope something like this will be back. Sounds very interesting, since we both actually get to do something, and those somethings affect the outcome of Armageddon in a small town in Shropshire. Even buying some chips might change things. "Actually, if the world ended in a little village in Shropshire, it'd be inconvenient." Well, we all know what God's Final Message To His Creation was: "We apologize for the inconvenience." Just played Dear Esther last night and I kept thinking that enjoy it more if I could interact with the game in at least some small way like picking up rocks on the beach or something. I'm very interested in this now. Dear Esther was one of my favorite things I've played all year so I'm definitely looking forward to this, especially since the idea sounds great just on it's own. It does sound pretty different though, it'll be interesting to see how much it actually feels like a spiritual sequel vs just another game by the same people. Still, sold either way. I think I'll buy this with my eyes closed, given how much Dear Esther was excellent. ...developer thechineseroom is adding "much more" interactivity, allowing the player to actually change the course of the game. Now THAT'S a high bar. If they can pull it off, it will be a pretty damn good game I think. Nice to see some developers trying out different and new things. Ok, yes. I've been thinking of something like this for a long time, and I'm glad to see I'm not the only one (seeing as I'm no developer...). A set timeline of an hour with the 'player' able to influence events how and when s/he chooses? Count. Me. IN. Sounds very interesting. I liked Dear Esther, but more interactivity would be neat. Also, hoping there`ll be some really amazing places in the game as well ( like the caves in Dear Esther. Sweet jebus, i was blown away how beautiful those caves were...). Fantastic! We need more games set in England, especially inconsequential Shropshire villages. Shropshire is quite a beautiful place, I'm sure there's plenty of room for Dear Esther's stunning aesthetic to return. Hurrah!! Sign me up. 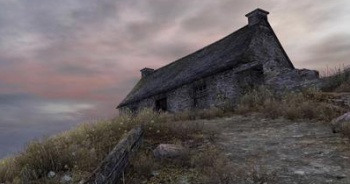 Playing through Dear Esther right now and loving it. I'm totally on board for some more artsy gaming time from these guys.